You may book a private psychic consultation with Ayesha from any location worldwide. Time differences can always be organized as she work between 12 - 16 hours per day. Each session lasts up to 1 hour and is conducted over a video/voice call. Email consultations are also available on request. Consultations have to be booked at least a day in advance as they fill up quickly. To check on availability please contact on Facebook chat and the management will update you on current available slots. You will find a detailed description of each consultation with Ayesha below. For the first time ever I am offering a two days meditation course for limited reservations only. This is for both local and International bookings.You may choose between an online or personal course. Meditation is a state of mind achieved through a deeper understanding of individual soul needs and tapping into your intuition and third eye in an effort to align with your higher self and connected dimensional origin. The state of bliss that will resonate with your soul, helping you to find clarity, healing (wide spectral physical and emotional healing) and adapting to a higher vibration. Do contact through email at - revolutionoflight@gmail.com or through Facebook Messenger for more information. You can expect answers concerning your current life issues and also any kind of guidance/channeled message your spirit guides/guardian angel and/or ascended masters may wish to provide. This is also for those of you who require individual spiritual guidance - either for one or multiple sessions on a bi-monthly or weekly basis. It involves a close observation of situations and consequences surrounding your life. This is also advised for those of you who go through long periods of depression or anxiety related issues. This in no way is a substitute for any treatment you could be under for the said condition but will act as a great support system that will enhance the healing process. This session involves a detailed approach to your past incarnations which you require healing or validation. It is advisable that a past life reading is taken very seriously as exposure to them may not necessarily be pleasant and is definitely not advised for entertainment purpose. This is a therapeutic process which helps you to disconnect from issues and ailments that continue to affect you in the current incarnation. It requires an interactive study and conscious disconnection process you will participate in. It is however, safe and only advised for some as it can only apply for situations where karma and soul contracts are not involved. If you have been having many dreams over a period of time or any particular dream that has caused a deep concern and curiosity, you may choose this session where you will receive a detailed explanation of the dreams. Should you wish to improve or study your spiritual journey/gifts - this would be an ideal option. An assessment that provides a detailed understanding of your abilities will help you decide where and how you can progress along this path of spiritual development. The guidance will be provided by your spirit guides and you may, if feel led to - opt to participate in our Spiritual Development Program as well. A session where questions relating to soul mate/twin flame relationships will be answered. Analysis and predictions on the level and any karmic/contract issues will be also explained. This is a spiritual guidance package for couples who are either married or are in a relationship. It involves a session with each partner and the concluding counseling that will require a review in 2 weeks to observe the progress. If you have been struggling to control your temper and would rather opt for a side effect free complete spiritual therapy, Ayesha conducts a weekly therapeutic session which helps you to gradually work your way into better anger management through analysis, guidance, meditation and healing.You will be required to go through a basic assessment session with Ayesha before you are provided with a therapeutic routine schedule since the requirements vary. We all face grief at some point in life as it is one of the most challenging experiences here. However, while some of us manage to cope on our own, others may find the entire experience overwhelming for a long period. This can often affect one's mental,physical and spiritual health to a great extent. 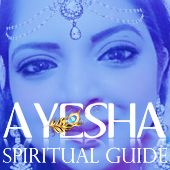 Ayesha reaches out to those who have trouble dealing with grief through her Grief Management Therapy that consists of a series of interactive sessions involving Analysis, Acceptance and Coping Techniques as well as the awareness on Self-Spiritual Gift Development for Connecting to loved ones in spirit. You will be required to go through a basic assessment session with Ayesha before you are provided with a therapeutic routine since the requirements vary. Anxiety and Depression are some of the most common mental conditions most of us face in this world. There are many reasons behind these conditions and the severity often depends on the management as well. Although medical care is widely available for them, a healthier and safer option would be to also consider a spiritual therapy that would gently uplift you with a deeper understanding and acceptance of your situation. Anxiety and Depression can deeply affectone's ability to function normally and if left unattended, can be highly toxic to mental and physical health. Ayesha offers a purely spiritual concept in helping those who suffer from these conditions through a therapy that begins with a study of your situation before a therapeutic schedule is provided. This therapy would include an analysis, spiritual guidance, awareness and coping techniques. The duration of the entire therapy depends on your comfort and pace. For detailed information on the Spiritual Development Program, please click HERE.